1.1 Level 1: The most common patterns found in nevi (excluding IDN). 1.1.4 Peripheral network with central hyperpigmentation. 1.5.7 Hairpin (looped) vessels with a white halo can be seen in keratoacanthomas (KA). In KA these looped vessels tend to be aligned at the periphery. 1.5.8 Polymorphous vascular pattern composed of dotted, short linear and long linear irregular (serpentine) vessels. Algorithm, Nonmelanocytic, Melanocytic, Two-step algorithm, Melanoma, Dermoscopy Two-step algorithm – cite! Two-step algorithm (message) Two-step algorithm – participate! We distinguish two different types of diagnostic algorithms: the classic two step algorithmIn mathematics and computer science, an algorithm (Listeni/ˈælɡərɪðəm/ AL-gə-ri-dhəm) is a self-contained sequence of actions to be performed. Algorithms can perform calculation, data processing and automated reasoning tasks. and the revised two step algorithm. In 2001, the Board of the Consensus Net Meeting agreed on a two-step algorithmThis glossary term has not yet been described. for the classificationis a general process related to categorization, the process in which ideas and objects are recognized, differentiated, and understood. of pigmented lesions of the skin . In the first level of decision making, the observer must decide whether a lesion is of melanocyticThis glossary term has not yet been described. or nonmelanocyticThis glossary term has not yet been described. origin. Once the lesion is identified to be of melanocytic origin, one can move on to level two. This second step the decision must be made if a melanocytic lesion is benignis any condition that is harmless in the long run, suspect, or malignantThis glossary term has not yet been described..
We recently came up with a further development of the two step algorithm which is a logical consequence of the 2 step approach. The top-down 2-step pattern analysisThis glossary term has not yet been described. approach builds upon the previous 2-step approach by eliminating the requirement to differentiate melanocytic from non-melanocytic lesions in step 1. This algorithm hinges on the concept that the observer’s diagnostic accuracyThis glossary term has not yet been described. for skin cancerThis glossary term has not yet been described., specifically melanomaThis glossary term has not yet been described., is, metaphorically, like a two-sided coin. One side of the coin requires the observer to make a specific diagnosisis the identification of the nature and cause of a certain phenomenon. Diagnosis is used in many different disciplines with variations in the use of logic, analytics, and experience to determine "cause and effect". In systems engineering and computer science, it is typically used to determine the causes of symptoms, mitigations, and solutions by recognizing the classic patternsThis glossary term has not yet been described./structuresThis glossary term has not yet been described. associated with neviThis glossary term has not yet been described., dermatofibromas (DF), intradermal neviThis glossary term has not yet been described. (IDNIntradermal nevus), basal cell carcinomas (BCCAbbreviation for Basal Cell Carcinoma), squamous cell carcinomas (SCCSquamous cell carcinoma), lentigines & seborrheic keratosesThis glossary term has not yet been described. (SK), angiomas, angiokeratomas, sebaceous hyperplasias, and clear cell acanthoma(also known as "Acanthome cellules claires of Degos and Civatte," "Degos acanthoma," and "Pale cell acanthoma") is a benign clinical and histological lesion initially described as neoplastic, which some authors now regard as a reactive dermatosis. It usually presents as a moist solitary firm, brown-red, well-circumscribed, 5 mm to 2 cm nodule or plaque on the lower extremities of middle-aged to elderly individuals The lesion has a crusted, scaly peripheral collarette and vascular puncta on the surface. It is characterized by slow growth, and may persist for years. The clinical differential diagnosis includes: dermatofibroma, inflamed seborrheic keratosis, pyogenic granuloma, basal cell carcinoma, squamous cell carcinoma, verruca vulgaris, psoriatic plaque, and melanoma. (CCA). Needless to say, the individual dermoscopic structuresThis glossary term has not yet been described. present in a lesion, within each diagnostic category (nevusThis glossary term has not yet been described., DF, BCC, etc), need to be placed within the contextThis glossary term has not yet been described. of the other features within the lesion. In other words, the global pattern defining a specific diagnosis is defined by the presence of distinct structures that have previously been found to carry a high predictive value for that specific diagnosis. The other side of the coin requires the observer to acknowledge the nevus patterns that require context for their interpretation and the patterns and structures associated with melanoma. Armed with a clinical differential diagnosis followed by evaluation of the lesion via this top-down 2-step approach can facilitate the rendering of an accurate diagnosis or at least guide the clinician towards the most appropriate managementThis glossary term has not yet been described. plan. Level 1: The most common patterns found in nevi (excluding IDN). consists of an organized networkThis glossary term has not yet been described. with minimal variation in its thickness and color (i.e., regular/typical networkNetwork with minimal variability in the color thickness and spacing of the lines; symmetrically distributed). The holes of the network are relatively uniform in their appearance. patches of typical network distributed in an organized manner. The network patches all have the same type of network with minimal variability in the thickness and color of the linesstreaksThis glossary term has not yet been described.. It is important to remember that melanoma on sun damaged skinThis glossary term has not yet been described. can sometimes appear as an isolated large lentiginous lesion with a patchy network. The cluesEvidence, in an investigation to the diagnosis include the ageprocess of becoming older of the patient since these melanomas occur in the elderly, the network is usually not distributed in an organized fashion, and there is usually focal granularityThis glossary term has not yet been described. present. The peripheral network is typical/regular and the central hypopigmented area is lighter in color compared to the network but darker than the surrounding skinThis glossary term has not yet been described.. Peripheral network with central hyperpigmentation. The peripheral network is typical/regular and the central hyperpigmented area consists of a blotchDark structureless areas. This blotch often due to the accumulation of melanin laden corneocytes in the straum corneum (i.e., lamella). This lamella can usually be tape stripped off revealing an underlying typical network. 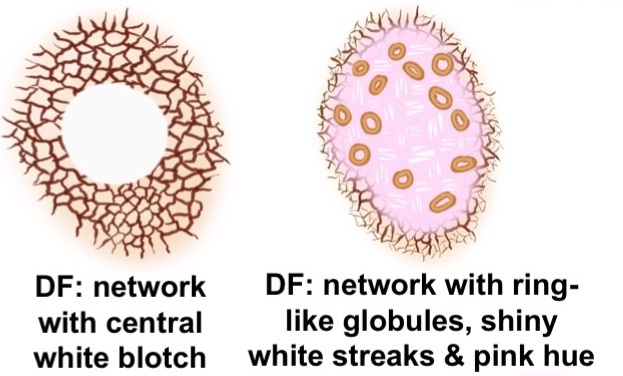 The peripheral network is typical/regular and the central brown globules are also regular displaying minimal variation in their size and colorColor (American English) or colour (Commonwealth English) is the characteristic of human visual perception described through color categories, with names such as red, yellow, purple, or blue.. This pattern consists only of globules that display minimal variability in their sizes and colorsThis glossary term has not yet been described. (i.e., regular/typical) and are distributed in an organized manner within the lesion. The globules can have different shades of brown. On rare occasion the globules can be white as seen on balloon cell nevi. While black and blue globulesclods blue small can on occasion be seen in congenital neviis a type of melanocytic nevus (or mole) found in infants at birth. This type of birthmark occurs in an estimated 1% of infants worldwide; it is located in the area of the head and neck 15% of the time., their presence should raise suspicion for melanoma. This is a specific type of globular pattern that consists of large brown angulated globules that create a pattern reminiscent of cobblestones. This is a pattern associated with congenital nevi. This pattern consists of a typical network nevus that has a peripheral rim of regular brown globules. This pattern is associated with the radial growth phase of Clark’s/dysplastic neviThis glossary term has not yet been described. and is commonly encountered in younger patients with the atypical mole syndrome. A homogeneous blue color with a whitish veil that encompasses the entire lesion’s surface is the hallmark of a blue nevusis a type of melanocytic nevus that clinically and dermoscopically will appear blue. The blue color and white veil in blue nevi will have minimal variation in hues. If there are multiple hues (i.e, heterogeneous blue color or non-homogeneous veil) then one should consider the diagnosis of melanoma. In addition, the differential for blue nevi should include epidemiologic metastasis and if nodular then one needs to consider the diagnosis of nodular melanomaThis glossary term has not yet been described.. This pattern consists of a nevus with homogeneous brown color with minimal to no variation in its hues. While it is usually devoid of any other structures, on rare occasions one can see a few regular dotsDots clustered at the center of the lesion, or located on the network lines (also called target network)/globules and fragments of network. This pattern is seen in congenital nevi. are defined first and foremost by their clinical characteristics of being firm papules that dimple on later pressure. A DF with this clinical morphologyThis glossary term has not yet been described. will usually reveal the following features when viewed with dermoscopyThe examination of [skin lesions] with a 'dermatoscope'. This traditionally consists of a magnifier (typically x10), a non-polarised light source, a transparent plate and a liquid medium between the instrument and the skin, and allows inspection of skin lesions unobstructed by skin surface reflections. Modern dermatoscopes dispense with the use of liquid medium and instead use polarised light to cancel out skin surface reflections. : A symmetric lesion with a thin, typical, peripheral network with a central white scar-like area. In the region between the network and the central scarlike area one can see ring like globules and vesselsThis glossary term has not yet been described.. When viewed with polarized lightThis glossary term has not yet been described. the central scarlike area will usually manifests a pink hue and will often also reveal shiny white lines. Level 3: Intradermal neviThis glossary term has not yet been described. are first and foremost defined by their clinical morphology as either raised dome shaped lesions or as sessile mamillated lesions. IDN with this clinical morphology will usually reveal one or more of the following features: comma vesselslinear curved short vessels dermal nevi, brown halo, globules, small foci of tan structureless pigmentation, hypopigmented areas. They can also reveal arborizing vesselsanalytic term is branched vessels; Bright red sharply in focus large or thick diameter vessels dividing into smaller vessels; BCC making it difficultneeding much effort or skill to accomplish to differentiate them from BCC. The clues to the diagnosis of IDN include the presence of the aforementioned features and lack of other BCC-specific features. In addition, the arborizing vessels in IDN are often a tad out of focus and have a bluish hue. In contrast, in BCC the arborizing vessels are usually sharply in focus and bright red in color. Leaf like areasThis glossary term has not yet been described. Blue gray ovoid nestWell-circumscribed ovoid structures with confluent or near confluent blue-gray pigmentation. Shiny white blotches and strandsWhite structures in the form of circles, oval structures, or large structureless areas that are bright-white longer and less well defined lines oriented parallel or distributed haphazardly, or forming blotches (shiny white clods). Seen only under polarized dermoscopy. White circlesThis glossary term has not yet been described. Hairpin (looped) vessels with a white halo can be seen in keratoacanthomas (KA). In KA these looped vesselsmetaphoric term: hairpin vessels <br /> two parallel linear vessels forming a half looped or hairpin like structure <br /> seen in seborrheic keratosis viral warts tend to be aligned at the periphery. Polymorphous vascular pattern composed of dotted, short linear and long linear irregularlinear vessels with multiple bends (serpentine) vessels. Fingerprint like structuresThey are areas consisting of fi ne parallel running lines of light brown to dark brown colors. They resemble the dermatoglyphics of a human fingerprint. Multiple milia-like cystsThis glossary term has not yet been described. Level 7: angiomaAngiomas are benign tumors derived from cells of the vascular or lymphatic vessel walls (endothelium) or derived from cells of the tissues surrounding these vessels. Angiomas are a frequent occurrence as patients age, but they might be an indicator of systemic problems such as liver disease. They are not commonly associated with malignancy.This glossary term has not yet been described./angiokeratomais a benign cutaneous lesion of capillaries, resulting in small marks of red to blue color and characterized by hyperkeratosisThis glossary term has not yet been described./hemangiomaThis glossary term has not yet been described.This glossary term has not yet been described. Angioma and hemangiomas: lacunaeThis glossary term has not yet been described. with red to maroon to bluish colors that are separated from each other with intervening stroma. 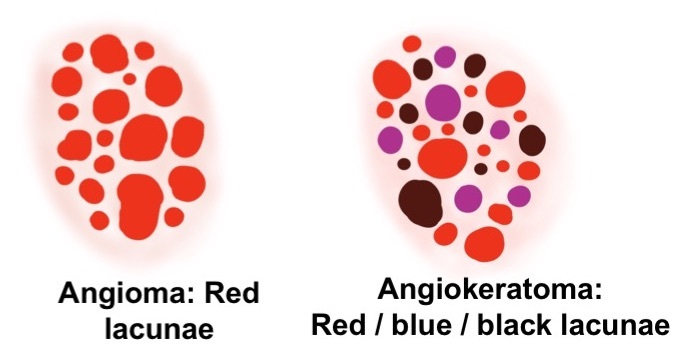 Angiokeratomas: lacunae with varying shades of red, maroon and bluish. In addition ,there are thrombosed lacunae that have a black color. The center of the lesion often has a blue-whitish veil and the surrounding skin has an erythematous halo. Level 8: Sebaceous hyperplasiaThis glossary term has not yet been described. These are small papules that reveal whitish/yellowish globules resembling pop-corn like structures. Crown vesselsRadial serpentine or arborizing vessels at the periphery of the lesion that radiate towards the center but do not cross the midline of the lesion. sebaceous hyperplasia are also seen. These vessels are present at the periphery. They radiate towards the center but do not cross its midline. Molluscum contagiosumThis glossary term has not yet been described. will manifest a similar pattern. Level 9: Clear cell acanthoma(also known as "Acanthome cellules claires of Degos and Civatte," "Degos acanthoma," and "Pale cell acanthoma") is a benign clinical and histological lesion initially described as neoplastic, which some authors now regard as a reactive dermatosis. It usually presents as a moist solitary firm, brown-red, well-circumscribed, 5 mm to 2 cm nodule or plaque on the lower extremities of middle-aged to elderly individuals The lesion has a crusted, scaly peripheral collarette and vascular puncta on the surface. It is characterized by slow growth, and may persist for years. The clinical differential diagnosis includes: dermatofibroma, inflamed seborrheic keratosis, pyogenic granuloma, basal cell carcinoma, squamous cell carcinoma, verruca vulgaris, psoriatic plaque, and melanoma. these lesions will reveal vessels, including dotted or glomerular, arranged in a string of pearlsCoiled or dotted vessels arranged in lines clear cell acanthoma pattern. If a specific diagnosis cannot be rendered then the observer moves to the second step of the algorithm. Therefore, the second step includes lesions that are suspicious for melanoma and lesions that cannot be safely diagnosed. The latter group of morphologically equivocal tumors consists mainly of nevi that demand special attention, but also of some melanomas lacking the usual disorganized distribution of structures and colors. Consequently, the main goal of the second step is to maximize melanoma detection and, thus, all lesions entering the second step should be evaluated for the presence or absence of melanoma specific patterns and structures. As a principleThis glossary term has not yet been described., the second step analysis should be always performed in conjunction with the overall clinical context of the lesion. This is because the diagnostic usefulness of each dermoscopic criterion for melanoma depends on the other tumors included each time in the differential diagnosis. Often, the differential diagnosis is narrowed by clinical data, since one or more diagnoses might be excluded (or considered very unlikely) based on epidemiologic characteristics of the patient (ex. age). Therefore, the dermoscopic analysis should be adjusted each time to the clinically established differential diagnosis and aim to narrow it further. 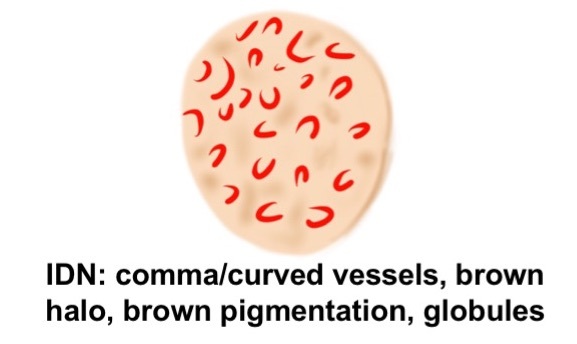 Examples: i) A recently appeared pigmented macule in a 70 years old man, dermoscopically displaying regularly distributed brown dotsDots are small, round structures of less than 0.1 mm in diameter that have a red color when corresponding to blood vessels; however, when due to melanin, their color ranges from black, brown, to blue-gray depending on the depth and concentration of the melanin in the skin (Tyndall effect). : Regular dotsDots clustered at the center of the lesion, or located on the network lines (also called target network) are considered as suggestive of a nevus. However, the diagnosis of a nevus is not included in the clinical differential diagnosis of a pigmented lesion developing at this age. Therefore, an epidemiologic characteristic (age) narrows the differential diagnosis into 2 main possible entities: melanoma and seborrheic keratosisThis glossary term has not yet been described./solar lentigoThis glossary term has not yet been described.. Between these 2 diagnoses, brown dots are strongly suggestive of melanoma. ii) Atypical networkNetwork with increased variability in the color, thickness, and spacing of the lines of the network; asymmetrically distributed; gray color is generally considered a melanoma-specific criterion. However, in a young individual with multiple atypical neviNevi that clinically look like melanoma but that histopathologically are not melanomas, a degree of network atypia in a nevus might be tolerated, especially in the presence of additional nevi with similar features. Precisely the same aspect in a solitary lesion would be considered as highly suspicious. iii) A pigmented lesion dermoscopically typified by regularly distributed peripheral streakslines radial (always at periphery) streaks Reed nevus melanoma recurrent nevus: in a child would be considered as diagnostic of Reed nevusThis glossary term has not yet been described.. In an individual of 60 years the same pattern would be strongly suspicious for melanoma. iv) A non-pigmentedThis glossary term has not yet been described. lesion dermoscopically displaying dotted vesselstiny pinpoint vessels: In a child, the differential diagnosis would include a Spitz nevusThis glossary term has not yet been described. and a viral wart. In an elderly individual, the differential diagnosis would include melanoma, intraepidermal carcinoma and lichenThis glossary term has not yet been described.-planus like keratosis. The two component pattern and the multi-component symmetric pattern are commonly encountered in patients with the atypical mole syndrome. However, if it is an outlier lesion compared with the patient’s other nevi then one should consider a biopsy or close digital monitoring to ensure stability. The homogeneous tan to pink nevus is a common pattern seen in nevi in individuals with type I-II skin. However, this pattern can also be seen in amelanotic and hypomelanotic melanomas. Thus, if such lesions appear to be outliers, caution should be exercised. The tiered peripheral globular pattern is associated with nevi having a spitzoid morphology on dermoscopy. While the management of spitzoid lesions remains controversial, if such a lesion develops in older age, then one should consider a biopsy. The typical starburst patternThis pattern consists of peripheral globules, pseudopods or streaks (or a combination of them), located around the entire perimeter of the lesion is associated with Reed’s nevi. While this is usually a benign pattern, on rare occasions melanoma can masquerade itself as a starburst pattern lesion. Thus, a classic starburst pattern in individuals under the age of 12 can be monitored, however, such lesion in older individuals should be viewed with suspicion. Melanomas will usually manifest a disorganized distribution of structures and colors making their identification quite easy. These lesions will reveal at least one, but usually more than one, of the melanoma specific structures listed below. On rare occasions melanomas will present with a symmetric and organized pattern but these tumors will almost always reveal one of the following features: starburst pattern, negative networkSerpiginous interconnecting broadened hypopigmented lines that surround elongated and curvilinear globules., blue-black or gray color, shiny white structuresThis glossary term has not yet been described., vessels or ulceration. A few melanoma patterns deserve special mention. Featureless or structureless (non-specific or feature poor) lesions are lesions that have no dermoscopic structures or do have dermoscopic structures but the structures present cannot be used to differentiate benign from malignant. If such lesions are non-palpable then they can be digitally monitored or can be biopsied. If such a lesion is palpable then digital monitoring is contraindicated and the lesion should be biopsied. Melanoma should be in the differential diagnosis for any blue-black nodule. Melanoma in situnot seen to be spreading from a localized position can manifest a pattern comprised of small foci of hyperpigmentation. The hyperpigmented areas differ from blotches in that they are small (cover <10% surface area), multiple and do not obscure the ability to see underlying structures. These melanomas will also often reveal prominent skin markings. Melanoma on sun damaged non-facial skinThis glossary term has not yet been described. (lentigo malignaThis glossary term has not yet been described.) is associated with the following patterns: patches of peripheral network islands, tan structureless areas with granularity, and a lesion with angulated linesSyn: polygons, zig-zag pattern Gray-brown lines that are connected at an angle or coalescing to form polygons. StructuresThis glossary term has not yet been described. Typical networkNetwork with minimal variability in the color thickness and spacing of the lines; symmetrically distributed consists of brown lines with minimal variability in their color and thickness. The holes of the network are of similar size. Atypical network consists of lines with increased variability in color and thickness. The atypical lines are often broadened, smudgy in appearance and often have a grayish color. Negative networkSerpiginous interconnecting broadened hypopigmented lines that surround elongated and curvilinear globules. Typical streaks consist of streaks arranged symmetrically around the entire perimeter of the lesion as seen in Reed’s nevi. Atypical streaks consist of streaks that are only focally present at the periphery. Typical dots consist of dots that are centrally located within an otherwise organized lesion or dots associated with a typical network. The typical dost associated with a typical network are located on the network lines on in the holes of the network. Any other manifestation of dots is considered atypical. Atypical dots are distributed asymmetrically, are not clustered in the center and are associated with an atypical networkNetwork with increased variability in the color, thickness, and spacing of the lines of the network; asymmetrically distributed; gray color. Typical globules are those found in nevi described in step-1 of this algorithm. Globules of similar shape, size and color distributed throughout the lesion (including cobblestone), at the periphery of an otherwise reticular nevus, or in the center of an otherwise reticular pattern nevus are considered typical. Any other manifestation of globules would be considered atypical. Typical blotch consists of one round to oval homogeneous blotch in the center of an otherwise reticular pattern nevus. Atypical blotch consists of an off center blotch or the presence of multiple blotches. The blotches can have irregular shapes and hues. Volar: melanomas on the palmsThis glossary term has not yet been described. and solesThis glossary term has not yet been described. Faceis a central body region of sense and is also very central in the expression of emotion among humans and among numerous other species. Angulated lines forming rhomboidsGray-brown angulated lines forming a polygonal shape around adnexal ostial openings. The presence of melanin inclusions defines the lesion as melanocytic. These lesions consist of melanocyte activation as seen in lentigo or melanocytic proliferation as seen in nevi and melanoma. While evaluating the nail plate it is important not to overlook evaluating the paronychia (micro-Hutchinson’s sign) area and hyponychial skin (parallel ridge patternVolar pigmentation forming lines, parallel, diffuse and irregular, along the ridges or cristae superficiales (raised portion of the dermatoglyphics) will be seen). The features to define early mucosal melanoma have not yet been elucidated. Clearly any lesion with a multi-component pattern should be viewed with suspicion. In addition, any lesion manifesting the colors blue, gray or white should be view with concern for melanoma. DownloadThis glossary term has not yet been described. This page was last modified on 10 September 2018, at 23:25.